why do i feel like eating pizza all of a sudden? looks delicious! Hello! So good to see you back with a recipe and with beautiful photos 🙂 I use the skillet-broiler method – it makes absolutely amazing pizza and no fussing with pizza stones, peels, papers, transferring pizza from place to place etc. A-ha! I can see a fellow pizza geek here. I thought you had to be Italian for that 🙂 It is by far the one thing I miss the most of Italy. I agree with basically all of your tips, although I have no tried the sourdough starter yet, and there is no cast iron plate anywhere is sight here, so I stick to my stone. I use more water in my dough, but I have a secret weapon: my partner was born in Naples and this somehow gives him a secret superpower of being able to stretch impossibly wet dough. If I'm handling it, I cut the water down. Another difference: to me it is vital to cook the sauce until it is reduced. I let it bubble for at least one hour. I think it improves the flavour. Anyway, a fantastic post. We pizza geek people are always looking for the next tip. 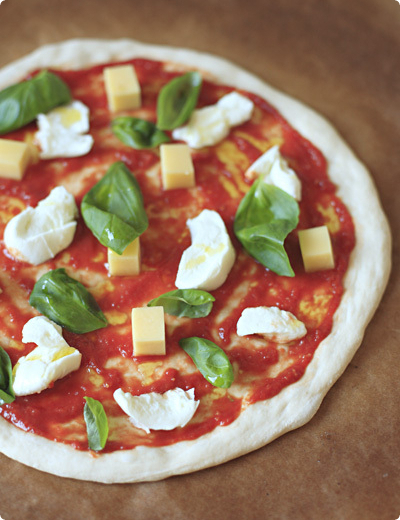 Yummy, Yummy and again yummy margherita is the my favourite pizza showing how delicious could be the simple things. Oh…Swoon! I am so glad to have rediscovered your blog again! You have such a great talent for providing information on technique, food history/culture and everything else beautifully relevant without even coming close to the dry style that so many other blogs have. I love these long posts (and am performing baker's percentages exercises while reading! ), THANK YOU! 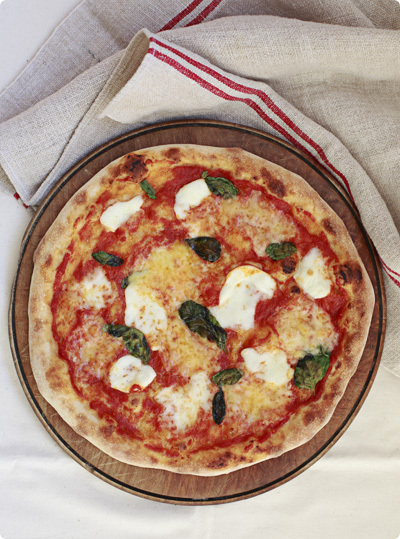 Ah, your pizza looks quite delicious…We are pizza connoisseurs around here and LOVE a sourdough crust. Yum. So happy to see you back and writing as graciously as ever…and with a gorgeous pizza to boot! A mouth-watering recipe. Wow! That´s fantastic, thanks for sharing this! Great tips here, even after I thought I did my research. I always ferment overnight but never tried for several days. Will also try w/ sourdough. I once used my outdoor grill for pizza using a baking stone. The results- the bottom of pizza was perfect but the top didn't brown well enough. 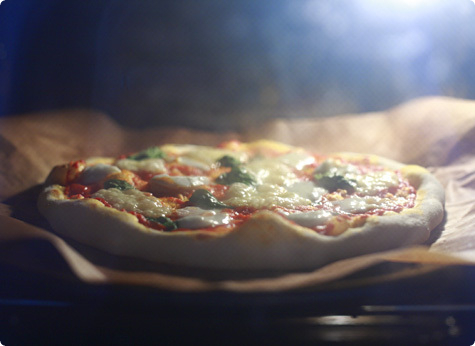 I'll be going back to the oven, but this time with the baking stone closer to the grill. Thanks for the great post.